The last time you made a necklace, it probably involved macaroni. Well here’s an idea inspired by a project on the blog aprettypennyblog.com: Turn an old shirt into a piece of wearable art that’s quite grown-up. Read more to find out how to make one of your very own! Lay the shirt on a flat surface and smooth it out with your hands. 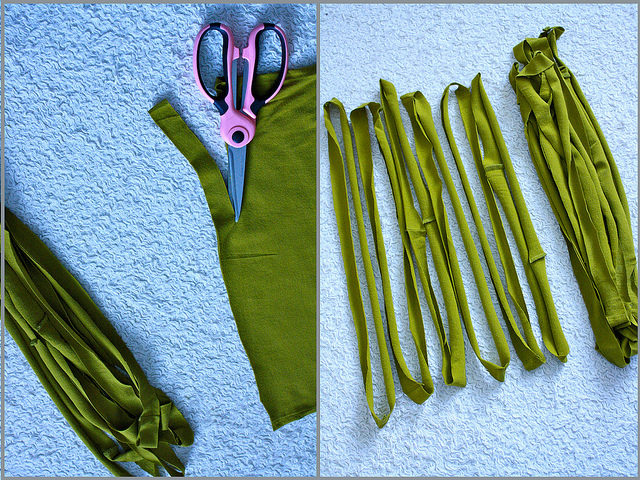 Start by cutting off and discarding the hem. 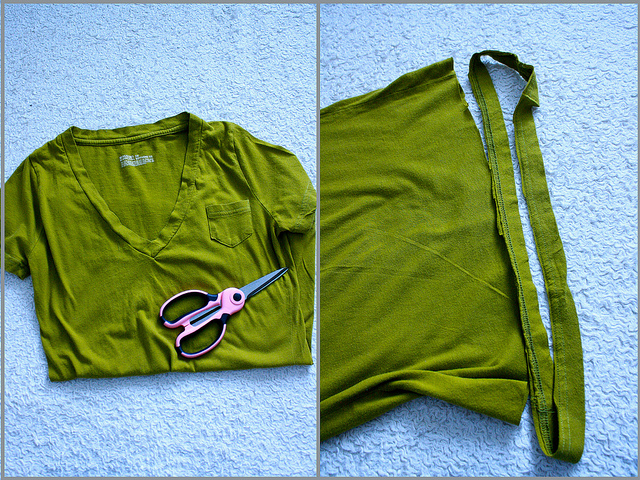 Beginning at the bottom of the shirt and working your way up, cut 1-inch strips to make loops. Vary the width of your strips based on your desired necklace thickness. I wanted a lot of tubes, so I kept my strips small. You can also cut a variety of sizes for one necklace if you want a less-uniform texture. 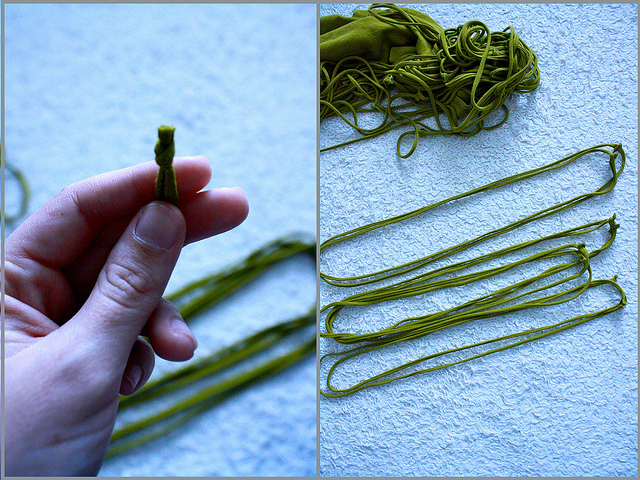 Stretch out the loops you just made so the cotton curls in on itself and forms long tubes. Double up each tube, matching up the seams at one end. If you break a loop at the seam while you’re stretching it out, just tie it back together with a simple knot and trim the excess. Group all of your tubes by size, keeping the seams together at one end. The illustration shown here uses a women’s tee, so the tapered fit resulted in a great variation of tube sizes. If you’re using a men’s tee, you can cut the tubes into various sizes and tie them back together as shown above. Gather them all together, with the longest tubes on the bottom and the shortest on the top, but save one! Cut the tube you saved in half to make it a long string. 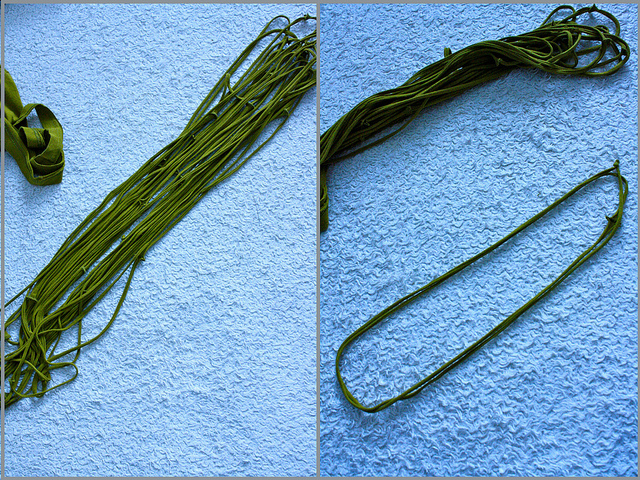 Tie the string in a knot near one end of the section of seams. Tightly wrap the string around all of the seams to cover them. Be careful not to get the tubes twisted or tangled as you’re wrapping. 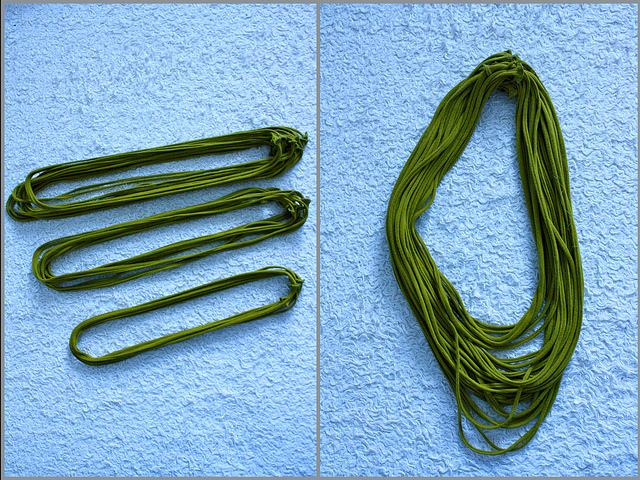 When everything is smooth and covered, tie off the other end of the string in a knot (using one of the necklace loops if you need to). That’s it! A Fabulous Necklace. Hand made in about 30 minutes flat! *DESIGNER’S NOTE: Want to turn this necklace from fabulous to Fan-Tabulous? Show off your wild side by Mixing & Matching other colors. 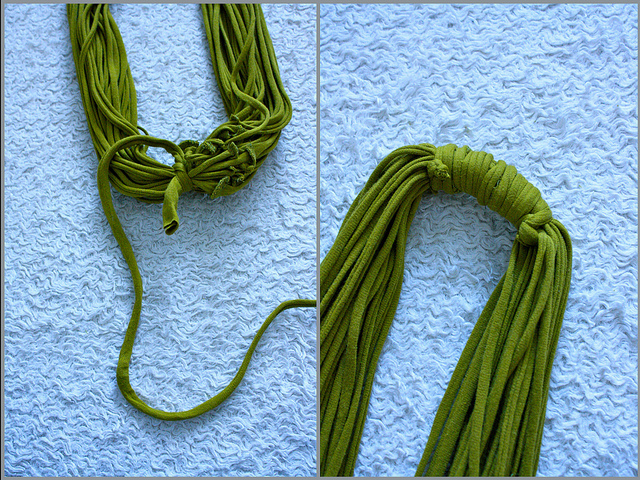 Posted on August 13, 2012, in All Things FABulous and tagged accessories, beauty, craft, DIY Monday, style, t-shirt necklace, tutorials. Bookmark the permalink. 10 Comments. I think we are going to all have a lot of necklaces. 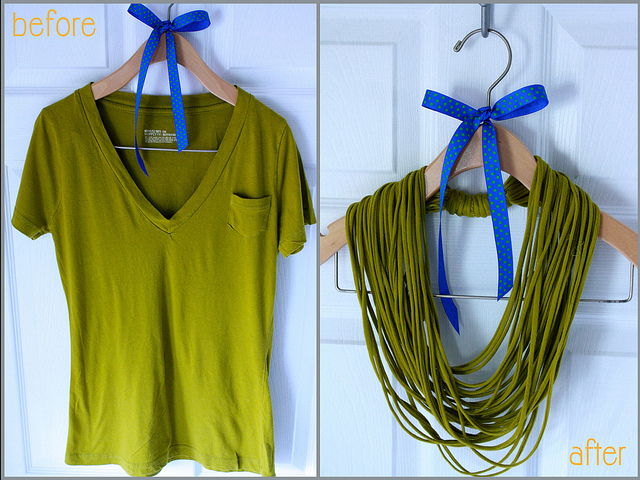 Who knew you can make a necklace out of a t-shirt. Wish I knew this a long time ago. I probably would’ve had them by the truck loads by now. OK! Maybe I would re-coupe some of the money I send on there. I know right. Who Knew? This is the perfect gift accessory for any occasion. I love it and it’s very creative and classy.